We would like to invite you to come to our office on 27th March between 1pm to 6 pm for an Open House Farwell, since we are closing our office with effect from March 31st 2019. 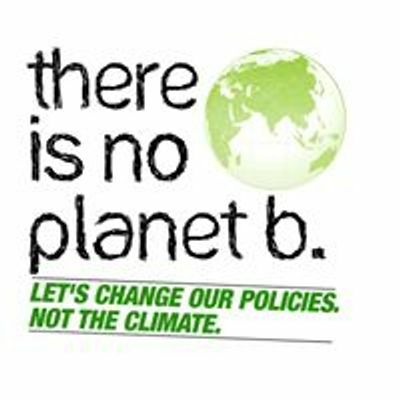 As you know, Heinrich Böll Stiftung (hbs) is a German foundation and part of the Green movement that has developed worldwide as a response to the traditional politics of socialism, liberalism, and conservatism. The promotion of democracy is one of the core themes of hbs’s work in Pakistan with a focus on ecological sustainability, human rights, self-determination and justice. We at Heinrich Böll Stiftung (hbs) believe that civil society acts as a bridge between Governments and community through amplifying subjugated voices, advocating for equality based human centric decision making and inculcating responsiveness. It ensures the spirit of democracy and safeguards democratic spaces especially during the times of change. Lately with the transition in the world order, the democratic spaces are shrinking and liberal voices are being contained. The air of mistrust towards the civil society is reflected in the structural changes introduced in governance processes that are limiting the role of civil society. Heinrich Böll Stiftung (hbs) believes in cooperation and collaboration hence the prime modus operandi of hbs in the last 25 years in Pakistan has been engagement through dialogue, research and support to civil society and the government institutions. However, for hbs to continue its work in Pakistan, it would require conducive environment and trust of the institutions. Currently, the Memorandum of understanding (MoU) presented by the Government of Pakistan for the international organisations curtails thematic areas of work. Therefore, this MoU is not acceptable as a basis for future work of our office in Pakistan. The Board and the membership assembly of hbs, after having waited patiently for over 5 years of the registration process, with heavy heart decided to cease its operations in Pakistan with effect to 31st March 2019. Hbs has spent 25 years in Pakistan and it has the honour of being the first country office of the foundation outside of Germany. It also has to its credit the honour of being the regional office for South Asia and South East Asia. We are sad that such profound relation is coming to an end at a time when emerging economy like Pakistan needs the support of thought leaders and civil society around the world. 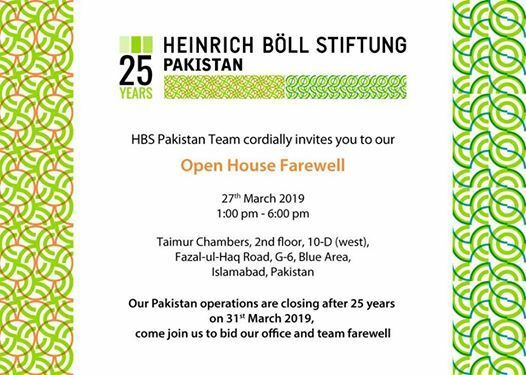 Nevertheless with a heavy heart we would like to thank and say good bye to our partners and Pakistani society hence we are organising a day long “Open House Farewell” on 27th March 2019- 1pm to 6pm (agenda is in the event page). At the event we will be displaying and distributing our publications for the last time before we leave Pakistan.